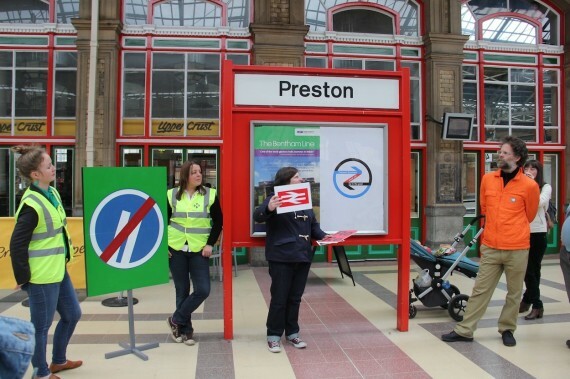 Since 2003, In Certain Places has been developing new and unusual art projects for the city of Preston. As the UCLan-backed organisation opens its doors for a short exhibition of work by four emerging artists, Bob Dickinson discovers more about its sociable approach to public art. 38 St Peters Street, Preston, is an unassuming terraced house, facing the library of the University of Central Lancashire (UCLan). It is also the head office of In Certain Places, the scheme led by UCLan’s Charles Quick and Elaine Speight, which since 2003 has worked in ingenious ways to bring art to the city. This mission has manifested itself in varying forms, including Jeppe Hein’s interactive water-work, Appearing Rooms (2006), John Newling’s The Preston Market Mystery Project (2008), and Shezad Dawood’s science-fiction film, Piercing Brightness (2011). A book, Subplots to a City, charting the story of In Certain Places, was published earlier this year, and recent exhibition, Open House, welcomed the public inside number 38 to view work by four emerging artists. The exhibition also acted as the launch for the latest edition of the Hannah Directory, a free guidebook to alternative art and culture in the north. Since 2003, 44 artists have made work with In Certain Places, around half of whom have been established names, and half local or emerging talent. Additionally, 63 speakers from a wide range of disciplines have taken part in symposia and events. Ironically, UCLan is now expanding, and it looks likely that under its masterplan number 38 will be demolished in a couple of years. Although this is no threat to In Certain Places, now seems like a good time to open up Open House and let the artists take over. So, I took the train to Preston and knocked on the door. Fletcher’s interest in the precariously employed led to the setting up of the Anxious Workers’ Club. 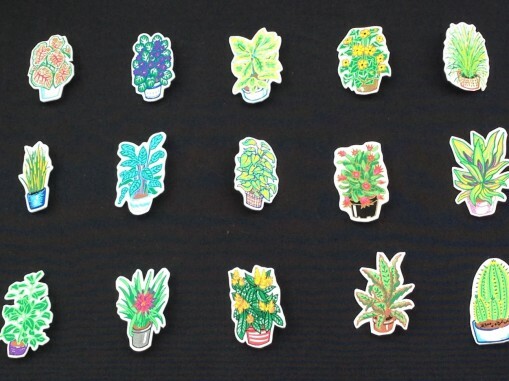 One year’s free membership gives you a handmade badge of a houseplant that you ‘adopt’, plus further news and information by post – a refreshing change from endless emails. Naturally, I joined, having adopted the Black-Eyed Suzie. Pattern-based artist Bonnie Craig was resident in the house for a fortnight. “I’ve been thinking about the history of the house and the way it went from a domestic space to become more institutionalised,” she says. She’s putting the finishing touches to some tiny details; subtle white flower and leaf patterns she has added around the walls, which were previously painted cream. Craig also designed wallpaper featuring aspects of Preston’s industrial history for the front room of the house, presented alongside work by Claire Tindale whose photographs and models depict domestic and working places in miniature. 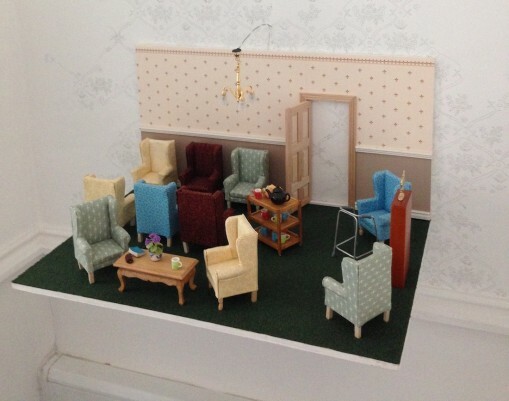 Inside a nearby chest of drawers, a tiny living room was based on one occupied by a patient Tindale met, who had served on a minesweeper in World War Two. Floating up from the floor, I was surprised to see the ominous spherical shape of a maritime mine. Facing the chest of drawers, piles of envelopes and stationery were occupied by tiny items of office furniture, reflecting the way this former domestic room became academic space. Upstairs at number 38, the walls were hung with posters designed by signwriter Cherry Tenneson, who has researched modernist transport information and its relation to Preston. Decorated with broad colourful abstract shapes, the posters bear deliberately confusing messages, including ‘Scheduled departure points are subject to diversions’ and ‘Outward journeys must not be in the past’, reflecting the artist’s interest in the way signage becomes redundant, for various reasons, not least the passage of time. There’s an important local legacy here, because when Britain’s first motorway, the Preston bypass, later part of the M6, opened in 1958, it had its own typeface for road signs. It was followed a decade later by Preston’s enormous, brutalist bus station (listed Grade II in 2013 after a preservation campaign led by In Certain Places), which still contains futuristic examples of 1960s signage, originally very simple but made over-complicated by later additions. Earlier, walking to Open House from Preston railway station, I had paused in the Flag Market to rest, briefly, on another of In Certain Places’ newest interventions, the Preston Bench. There are six of these elegant wooden objects, capable of seating up to ten people. Each has a large, single wheel on one end, enabling it to be moved. 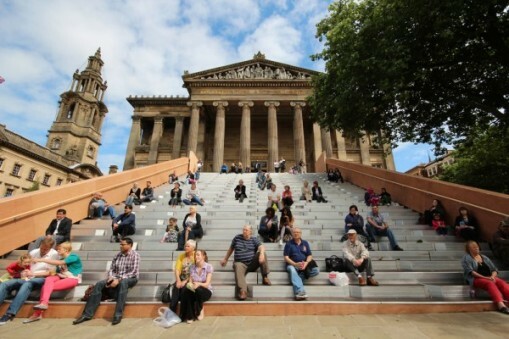 They were co-designed by Charlie MacKeith of Research Design and Quick, says the bench evolved from In Certain Places’ 2013 project, Harris Flights (pictured above), when a temporary wooden staircase was erected in front of the Harris Museum. Long may In Certain Places provide sociable art to the people of Preston. Bob Dickinson is a writer and broadcaster based in Manchester.